I'm moving right along with my FAL list. My mug rugs are finished and on their way to Australia already. I'll share them just as soon as my partner lets me know she has received them. In the meantime, here's another And Sew On block I finished last night. 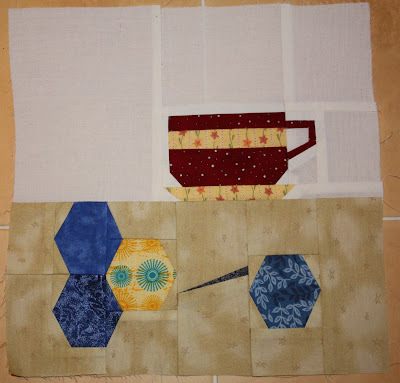 This one may be my favourite of all Kristy's And Sew On blocks because of those beautiful hexagons! I think I'll add a little blue thread between the needle and the hexagon still waiting to be sewn on, and I'm not sure what happened to make the left side of the block so wonky, but other than that I'm pleased with this. Here are the three blocks I have finished so far. Only two left to go and then I can start putting the top together. I put the blue hexagons on another few hexagon flowers too, including this one. It may well be my favourite! I love the purple star and the fussy cut shell in the middle. I'll be linking with Freshly Pieced, My Quilt Infatuation and Kristy at Quiet Play. I really like your hexagon flower! I like the seashell. And those are some crazy looking yellow and purple hexagons. Very impressive! Love your PP blocks...especially the scissors! Great job. Your blocks are looking just lovely! 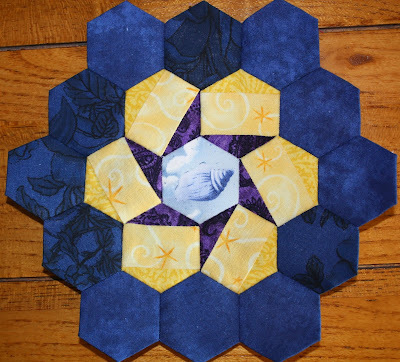 your paper pieced blocks look great! I love that one with the iron especially! It's too cute! That hexagon flower is very original! YAY for creativity! The other blocks are super cute!